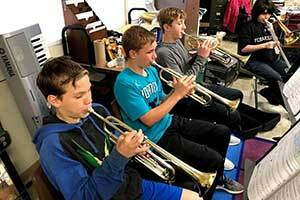 During the Spring 2018 semester, Blue Ridge introduced band instruments into the middle school curriculum. There had not been a band program at Blue Ridge since 2000. 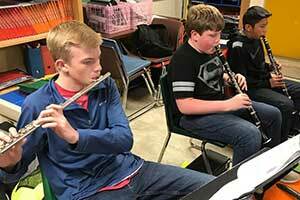 BRSEF has helped greatly with the funding of the new band program for the middle school at BREC to help purchase instruments, books and supplies. Blue Ridge is one of only a few public schools in NC where students in grades Pre-K through grade 13 all share the same campus. 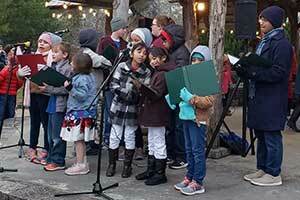 In the photo above, a chorus of all ages sings for the tree-lighting at The Village Green in Cashiers. The Blue Ridge School Education Foundation provided funds for the purchase of performance attire for the high school chorus. 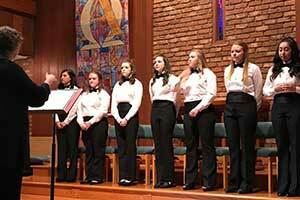 In the photo above, students perform a concert at Cashiers United Methodist Church. Music theater has become a popular activity at Blue Ridge with a series of shows, beginning with the Spring 2016 production of "Seuss!" which featured 25 students.Thanks to generous donors, Blue Ridge was able to update stage lighting and purchase a new sound system to enhance shows, such as "Annie" which was performed Spring 2017. 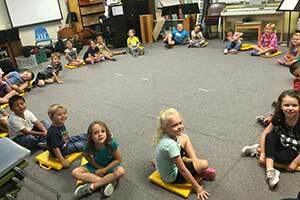 Elementary students, like this kindergarten class, attend music classes once a week. 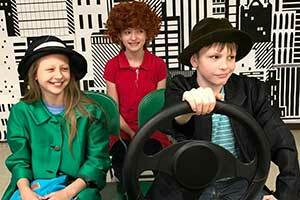 Since this photo was taken, the old, worn carpet in the music room has been replaced with new flooring. The Music Program is funded not only by the Blue Ridge School Education Foundation, but by community partners such as Mountain Youth Charities, Jackson County Arts Council, WCU College of Education and Allied Professions (yearly SUTEP grant), Cedar Creek Raquet Club, Rotary Club of Cashiers Valley, The Church of the Good Shepherd, Grace Community Church, Cashiers United Methodist Church, Cullasaja Women's Outreach, Acoustic Corner (Black Mountain), Glenville Community Development Council, and the Community Foundation of WNC. Many private donors participate as well. 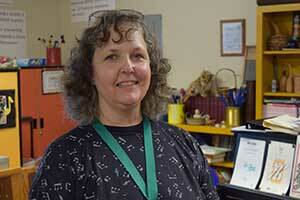 Sarah Hall has been teaching music since August 2015 for both Blue Ridge School and Blue Ridge Early College with classes for pre-K, elementary, middle school and high school students. She earned both a Bachelor's degree in Music Theory and Composition and a Master of Arts degree in Music from Appalachian State University, then continued with education courses for teaching licensure from Pfeiffer University and post graduate study in music education at the University of North Carolina at Greensboro. In addition to public school and university-level music teaching, Mrs. Hall has had several original compositions published, and an opera she composed was performed by Opera Carolina across the state for their education tour. She has also written two children's books. Bryan Heller is a professional pianist who lives in Brevard NC, but continues to work throughout Cashiers and Highlands NC. 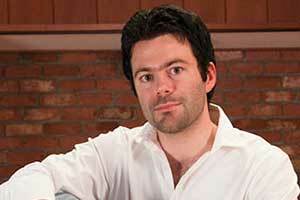 Bryan attended WCU under a full-paid music scholarship and graduated in 2005 with a B.M. in commercial and electronic music. Today, Bryan is the pianist for the Cashiers United Methodist Church, Our Lady of the Mountains Catholic Church, the Highlands Chorale, the Western Carolina Singers, the Cashiers Community Chorus, and is the artist-in-residence at Blue Ridge School and Early College. He also has his own music studio of 18 students, ranging in all ages and abilities.